If the vibrancy on display in Thinking in the Past Tense is any indication, the study of intellectual history is enjoying an unusually fertile period in both Europe and North America. This collection of conversations with leading scholars brims with insights from such diverse fields as the history of science, the reception of classical antiquity, book history, global philology, and the study of material culture. The eight practitioners interviewed here specialize in the study of the early modern period (c. 1400-1800), for the last forty years a crucial laboratory for testing new methods in intellectual history. The lively conversations don't simply reveal these scholars' depth and breadth of thought; they also disclose the kind of trade secrets that historians rarely elucidate in print. 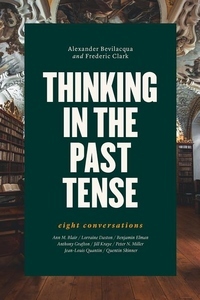 Thinking in the Past Tense offers students and professionals alike a rare tactile understanding of the practice of intellectual history. Here is a collectively drawn portrait of the historian's craft today.